NEW: Statement denies "any U.S. role in micromanaging internal Pakistani affairs"
WASHINGTON (CNN) -- The chairmen of the House and Senate committees on foreign relations Wednesday provided a written explanation of the $7.5 billion Pakistan aid bill, a response to Pakistani protests of U.S. meddling in its affairs. A member of an Islamic fundamentalist party protests the aid bill October 2 in Pakistan. Senate Foreign Relations Committee Chairman John Kerry and House Foreign Affairs Committee Chairman Howard Berman were joined by Pakistani Foreign Minister Shah Mahmood Qureshi as they spoke to reporters. Qureshi had rushed back to Washington this week to report on the Pakistani Parliament's opposition to the five-year package of nonmilitary aid. Some Pakistani politicians said the aid bill was an American attempt to micro-manage Pakistan's civilian and military affairs. Sen. Kerry, D-Massachusetts, said an "explanatory statement" will accompany the aid bill, which is awaiting President Obama's signature. "Everyone is on the same page," Kerry said in a statement to journalists outside the door to the Foreign Relations Committee. "We are all clear about the intentions of the legislation." 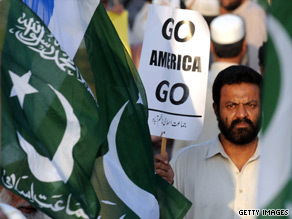 He said the bill "demonstrates the American people have a long-term commitment to the people of Pakistan." Qureshi thanked the congressional leaders and said he will return home to report to the Parliament. "You heard me," Qureshi said to Kerry and Berman, referring to his relaying the concerns about the aid bill. "And this document, which I think is an historic document, is a step forward in our relationship." The three men would not take questions after they spoke with reporters Wednesday. The key element of the statement, which will be attached to the aid bill as it is signed into law, is that no interference was intended with Pakistani civilian and military operations. The statement says the bill sets out a variety of requirements to ensure U.S. efficiency and compliance, and places no new conditions on the government of Pakistan. "There is no intent to, and nothing in this act in any way suggests that there should be, any U.S. role in micromanaging internal Pakistani affairs, including the promotion of Pakistani military officers or the internal operations of the Pakistani military." Sen. Berman, D-California, said the statement is "a reflection of our desire to be long-term partners with the Pakistan people."